I would like to receive occasional information and updates from Restart Weekend 2019 and jumblebee. 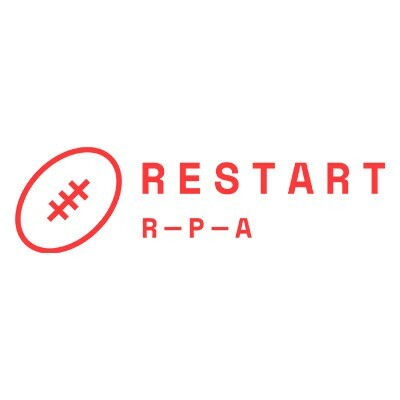 Round 19 of the Gallagher Premiership (12th - 14th April) is dedicated to Restart, the official charity of the Rugby Players Association, with the aim of raising over £20,000 to help current and former players facing mental health struggles. Take a look at our film, featuring players we've helped, to hear more about the work we do to support players. All funds raised will go directly towards supporting players struggling with mental health issues and will help fund our confidential counselling service. 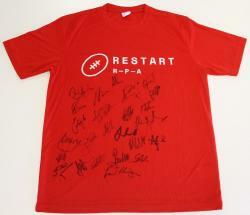 For updates and news follow @RestartRugby on Twitter and Instagram. 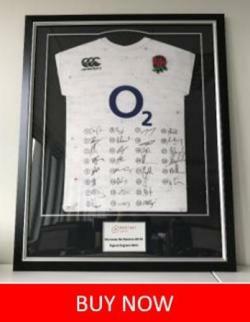 Official England shirt signed by the 2019 Guinness Six Nations squad. The shirt is framed with a presentation plaque and comes with certificate of authentication. UK delivery only and delivery cost included. Official England shirt signed by the 2018 Quilter Internationals squad. The shirt is framed with a presentation plaque and comes with certificate of authentication. A tech style t-shirt as worn by all Premiership players in their warm-ups during round 19 of the Gallagher Premiership. 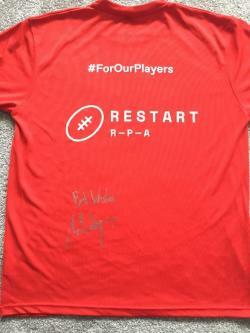 Colour red, with the Restart logo on the front and the Restart logo on the back and #ForOurPlayers across the shoulders. NB: Please see Product Guide for size information. Official replica home playing shirt, signed by the 2018/19 Bath squad for Restart Weekend 2019. 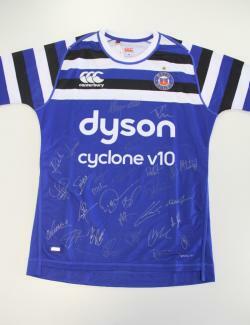 Official replica home playing shirt, signed by the 2018/19 Bath Rugby squad for Restart Weekend 2019. 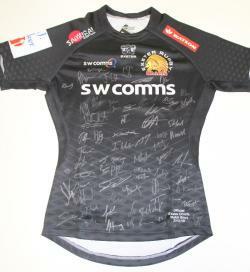 Official replica home playing shirt, signed by the 2018/19 Exeter Chiefs squad for Restart Weekend 2019. 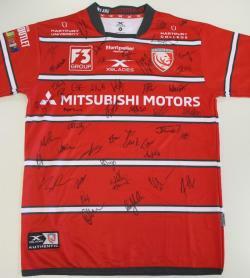 Official replica home playing shirt, signed by the 2018/19 Gloucester Rugby squad for Restart Weekend 2019. 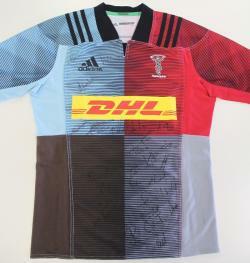 Official replica home playing shirt, signed by the 2018/19 Harlequins squad for Restart Weekend 2019. 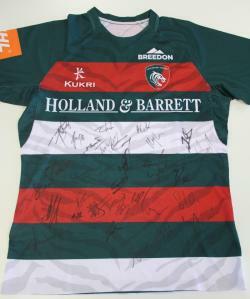 Official replica home playing shirt, signed by the 2018/19 Leicester Tigers squad for Restart Weekend 2019. Official replica home playing shirt, signed by the 2018/19 Newcastle Falcons squad for Restart Weekend 2019. 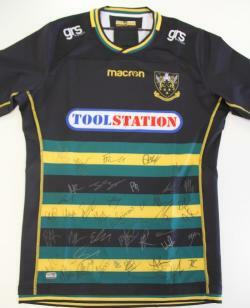 Official replica home playing shirt, signed by the 2018/19 Northampton Saints squad for Restart Weekend 2019. 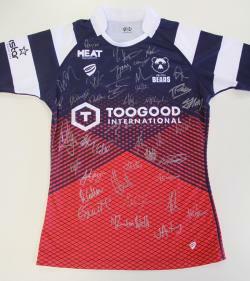 Official replica home playing shirt, signed by the 2018/19 Sale Sharks squad for Restart Weekend 2019. 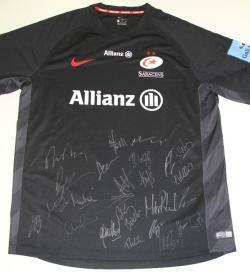 Official replica home playing shirt, signed by the 2018/19 Saracens squad for Restart Weekend 2019. 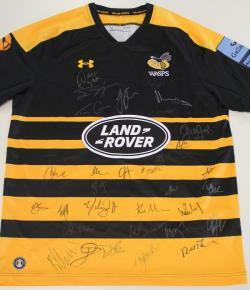 Official replica home playing shirt, signed by the 2018/19 Wasps squad for Restart Weekend 2019. 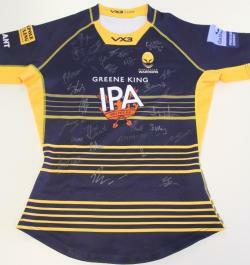 Official replica home playing shirt, signed by the 2018/19 Worcester Warriors squad for Restart Weekend 2019. 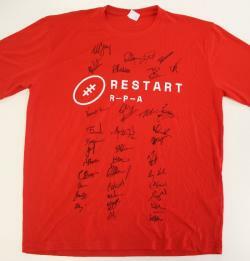 Limited edition (1 of 3) Restart t-shirt, signed by the 2018/19 Bath Rugby squad for Restart Weekend 2019. The t-shirts are as worn by the players in their warm up for their match on Saturday 13th April. 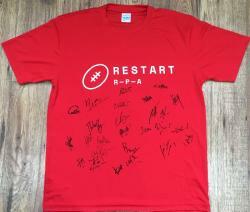 Limited edition (1 of 3) Restart t-shirt, signed by the 2018/19 Bristol Bears squad for Restart Weekend 2019. The t-shirts are as worn by the players in their warm up for their match on Saturday 13th April. 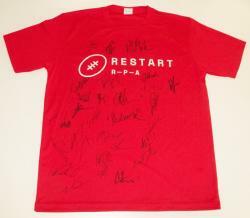 Limited edition (1 of 3) Restart t-shirt, signed by the 2018/19 Exeter Chiefs squad for Restart Weekend 2019. The t-shirts are as worn by the players in their warm up for their match on Sunday 14th April. 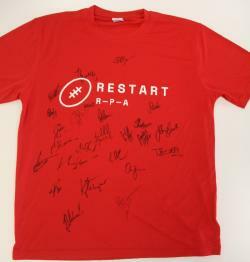 Limited edition (1 of 3) Restart t-shirt, signed by the 2018/19 Gloucester Rugby squad for Restart Weekend 2019. The t-shirts are as worn by the players in their warm up for their match on Saturday 13th April. 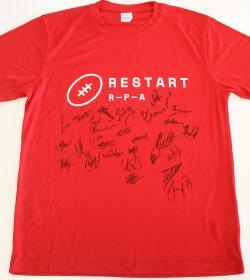 Limited edition (1 of 3) Restart t-shirt, signed by the 2018/19 Newcastle Falcons squad for Restart Weekend 2019. The t-shirts are as worn by the players in their warm up for their match on Friday 12th April. 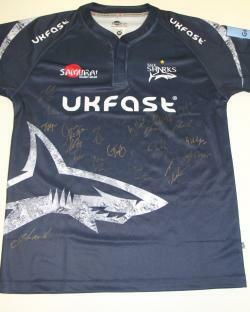 Limited edition (1 of 3) Restart t-shirt, signed by the 2018/19 Sale Sharks squad for Restart Weekend 2019. The t-shirts are as worn by the players in their warm up for their match on Saturday 13th April. 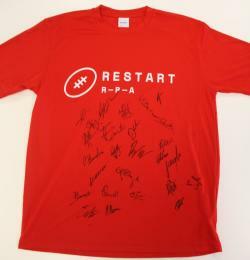 Limited edition (1 of 3) Restart t-shirt, signed by the 2018/19 Worcester Warriors squad for Restart Weekend 2019. The t-shirts are as worn by the players in their warm up for their match on Saturday 13th April. 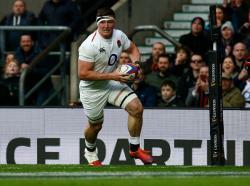 The Gallagher Premiership Rugby Final is a sensational day of top-class rugby at Twickenham Stadium. Watch the best two club sides in England battle for the honour to be crowned Gallagher Premiership Rugby Champions on 1st June 2019. 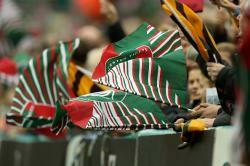 Six VIP hospitality tickets to Leicester Tigers v Bristol Bears at Welford Road Stadium on Saturday 27th April. You and your guests will receive a complimentary pre-match bar, followed by a four course pre-match meal served with wine. Take your exclusive reserved grandstand seats and then head back into the Honours for post-match hot supper or afternoon tea dependant on kick off time. Each guest will receive a souvenir programme from the game and will enjoy a Q&A session with some of the Tigers squad. Reserved car parking available. Tickets are non-refundable and can not be exchanged. 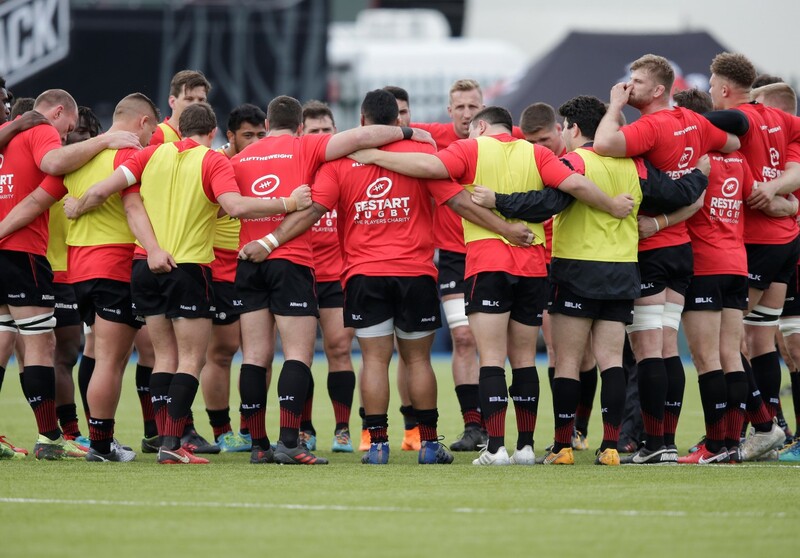 The chance for four guests to watch live training session pitch-side at the Twickenham Stoop or their training ground at Surrey Sports Park in Guildford as the Harlequins squad prepare for their next fixture. 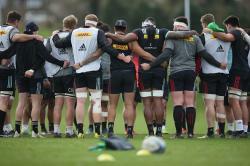 Afterwards, head inside with Mark Lambert and the Harlequins players for lunch and refreshments to finish off the day! 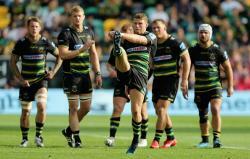 Four matchday tickets to watch Northampton Saints v Worcester Warriors at Franklins Gardens on Saturday 4th May. Kick off at 3pm. Ticket vouchers must be exchanged at the Saints Ticket Office and cannot be redeemed online and must be retrieved at least 48 hours before matchday. 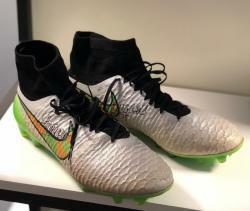 Signed Henry Slade NIKE tempo elite boots. Worn by Henry with his name embroidered in the side of right and left boot, and signature on both boots. Size 11. 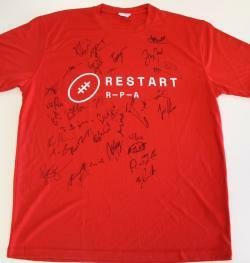 Limited edition (1 of 3) Restart t-shirt, signed by the 2018/19 Northampton Saints squad for Restart Weekend 2019. The t-shirts are as worn by the players in their warm up for their match on Saturday 13th April. 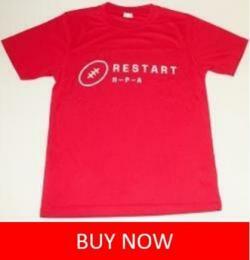 Limited Edition (1 of 1) Restart t-shirt, signed and worn by Bristol Bears', Ian Madigan for Restart Weekend 2019. Former New Zealand fullback and currently playing at Bristol Bears, Charles Piutau, has signed a pair of rugby boots for Restart Weekend 2019. 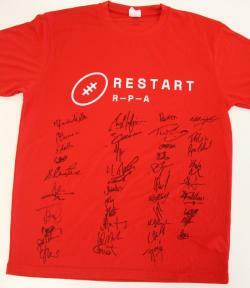 Limited edition (1 of 3) Restart t-shirt, signed by the 2018/19 Saracens squad for Restart Weekend 2019. The t-shirts are as worn by the players in their warm up for their match on Saturday 13th April. 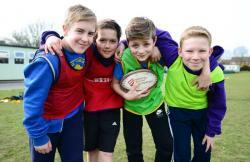 Here is a unique opportunity for a junior rugby team (up to 25 players) to take part in a Bristol Bears Community Foundation Rugby Training Session. The training session will cater for players of all abilities by equipping them with the skills essential for performing at their best. Whether you are an aspiring professional rugby player, or someone who simply wants to improve their game, the Bristol Bears Community Foundation’s highly qualified and experienced team of coaches will deliver a fun-filled session and help take your game to the next level. The session will consist of a games-based combination of technical input and fun and incorporate a level of contact progressing through touch, grab and full contact. Two tickets to any Wasps home match of your choice during 2019/2020 season. Tickets must be secured at least two weeks prior to your choice of game. Guest should collect tickets from the players section of the Richo Arena and correspond directly with the contact at personnel. Tickets are non-refundable. 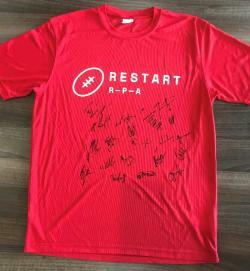 "Limited edition (1 of 3) Restart t-shirt, signed by the 2018/19 Leicester Tigers squad for Restart Weekend 2019. The t-shirts are as worn by the players in their warm up for their match on Friday 12th April. 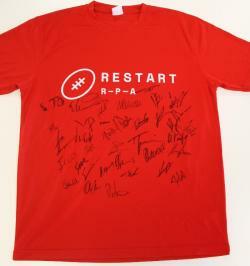 Limited edition (1 of 3) Restart t-shirt, signed by the 2018/19 Wasps squad for Restart Weekend 2019. The t-shirts are as worn by the players in their warm up for their match on Sunday 14th April. 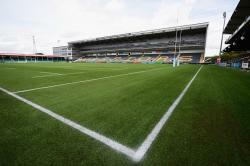 The chance for four guests to watch live training session pitch-side at Sixways Stadium as Worcester Warriors prepare for their next fixture. Afterwards, head inside for a behind the scenes tour and lunch with the players! Official Quilter Autumn Internationals 2018 England shirt from Mark Wilson. Worn at the England v Japan 2018 game with Mark's name embroidered on the right hand side. Signed adidas boots by Sales Sharks and England Rugby's, Tom Curry. Worn by Tom during the Guinness Six Nations 2019 Championship. Both right and left boots signed by Tom Curry. 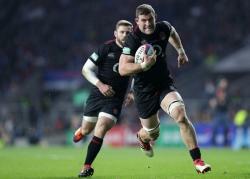 A unique chance for up to 10 guests to participate in a 90 minute kicking session with Newcastle Falcons fly half, Toby Flood at Kingston Park, Newcastle Upon Tyne. Date to be manually agreed by all parties and kicking session should be used by end of 2019/2020 Premiership pre-season. 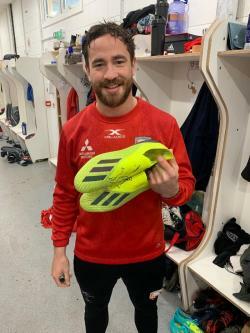 Signed boots by Gloucester Rugby and England Rugbys', Danny Cipriani. Worn this season by Danny. Size 10 UK. Both right and left boots have been signed by Danny Cipriani. 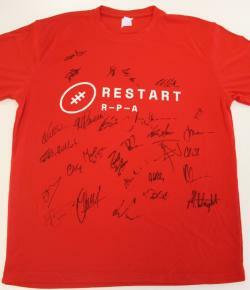 Limited edition (1 of 3) Restart t-shirt, signed by the 2018/19 Harlequins squad for Restart Weekend 2019. The t-shirts are as worn by the players in their warm up for their match on Saturday 13th April. 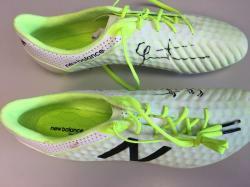 Signed boots by Worcester Warriors, Francois Hougaard. Size 9 UK. Worn by Francois. Both right and left boots have been signed by Francois Houugard. 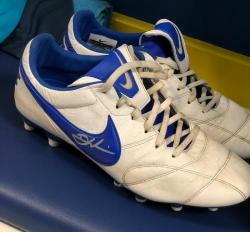 Worn and signed boots by Worcester Warriors, Duncan Weir.